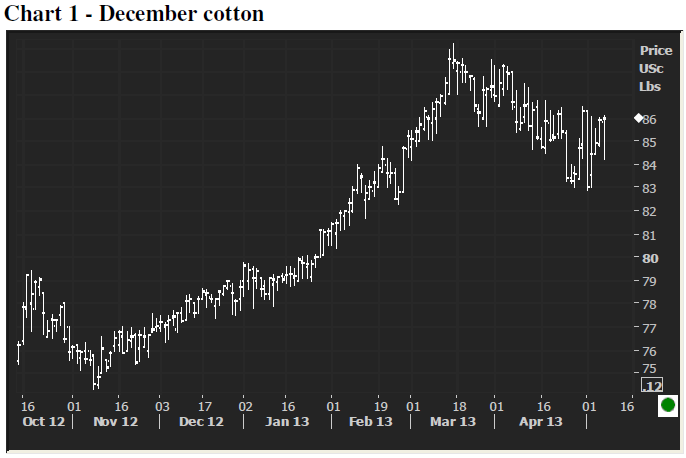 Why aren’t burdensome cotton stocks pushing prices down? The March 28 Planting Intentions Report showed that U.S. farmers will plant 10.026 million acres for the 2013-14 cotton crop to be harvested this coming fall, down from last year’s final planting estimate of 12.701 million acres. The forecast was near the low end of analysts’ guesstimates. New-crop contract months rallied for a few days in response, but the 88¢-cent-per-pound level proved to be a near-term top. Prices proceeded to drop in the weeks that followed, by about 5¢ per pound, before finding some support at the 85¢-per-pound level. We pointed out in our last discussion of cotton that even with the push toward the 90¢-per-pound level, it was still more profitable to plant soybeans or corn. No doubt the rally that began in November inspired some additional acres, but a new dynamic was introduced into the market that could be even more instrumental in expanding U.S. cotton area. It has been a very wet late winter and early spring, which has delayed corn planting. In regions where the optimum window for planting corn will close before farmers can get into the fields, cotton planting will be a viable alternative. Some analysts say that we could see as many as 1 million acres added to cotton area. The recent selloff in December cotton back down to 83¢ per pound reflected expectations for larger plantings. As far as the other major producing nations are concerned: China and Australia will plant smaller crops as well, but Brazil, India and Pakistan will see an increase in cotton area. Total global production is expected to decline by about 3%, to 115.5 million bales. However, with a modest 2.6% increase in global consumption, to 109 million bales, burdensome inventories will continue to grow. U.S. exports have been surprisingly strong and have provided some support to the market. Commitments were lagging behind last year’s pace as recently as early April, but have now pulled ahead of last year by close to 1 million bales, and are in perfect position to meet the USDA’s upwardly-revised target for 2012-13 sales of 13 million bales. But is it enough?